While every piece may not be a cup, bowl, or plate, all forms present themselves with a sense of purpose. The tall, shapely vessels provide upward motion with bright colors and clean lines. Uncommon shapes often work best for common everyday uses. Making something with your hands allows you to know, personally, what it's made to do. If beauty need be the only cause, then sometimes that's the use that matters most. Intuitive, durable designs, time-tested and made specifically for daily use. Letting it be as it need be. Each piece has been personally hand-formed and no two will be exactly alike. However, consistent methods allow forms to nest neatly into one another, as though they have been precisely measured. In exploring a range of shapes and sizes, a cohesive body of work has been amassed to represent a continuing theme: functional items are interactive. 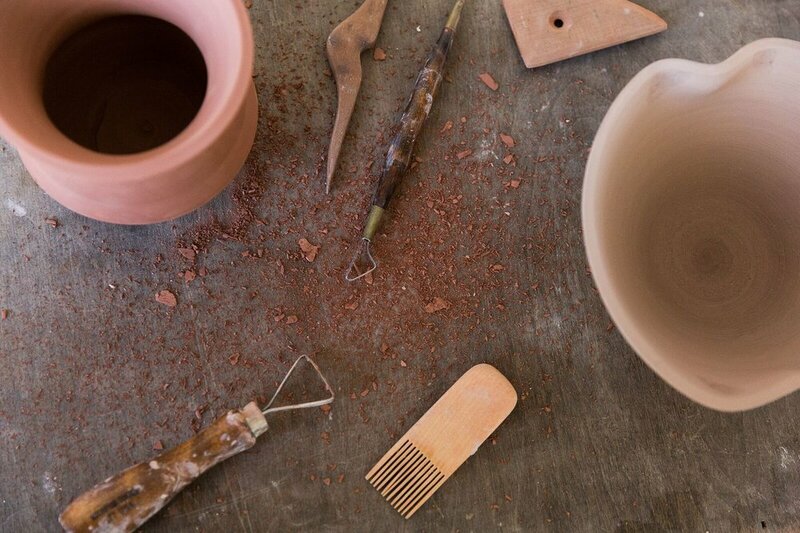 Clay bodies typically range from Stoneware to dark red Earthenware, and all items are microwave, oven, and dishwasher safe. While sculpting has always been an available option, wheel-throwing continues to be the preferred method of creation for all items shown here. Balancing art in everyday life, Pace has fine-tuned shape, form and function since 2002. During this time, participating as both teacher and student has allowed for critical thinking and the ability to identify enhancements when they arise. There is an apparent verisimilitude between the objects, but over time they have shifted towards something ultimately more refined. Many thanks to The Clay Studio in Philadelphia for three years of education, community, and direction.